Mya #5181 - Yankee Golden Retriever Rescue, Inc.
Mya’s owner moved into senior housing and could not take her with him. Mya was 7 years old and had been part of the household since she was 3 months old. Her owner had hoped that a relative could keep her, but that was not possible. Wanting Mya to get a home that was right for her, he contacted YGRR. Mya was brought to one of the animal hospitals we work with for a complete checkup. Mya was treated for a urinary tract infection and was given a dental cleaning. We also discovered that she had some hip dysplasia which would be helped by putting her on a diet and exercise program. Mya came to Riverview to finish her medications and settle in. It was immediately apparent that Mya was an adorable girl! To say she loved toys was an understatement. She would carry around stuffed toys or tennis balls with her wherever she went. She also loved to show them off and would run over to push her head into you and have you admire her toy. She was very happy and affectionate. She instantly won the hearts of everyone she met! Once Mya had her veterinary rechecks and was cleared to go to a new home, it didn’t take long for this special girl to find the perfect family! 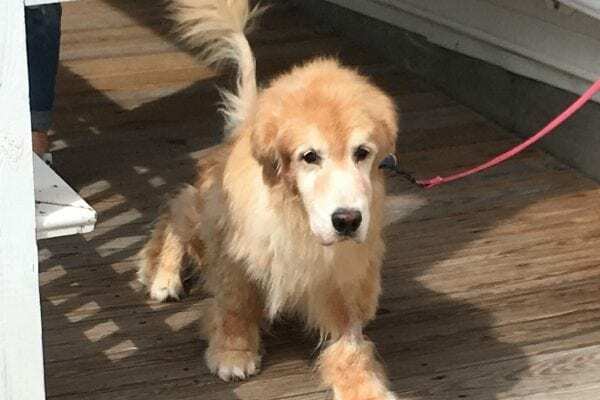 Repeat adopters who had recently lost one of their dogs to osteosarcoma were looking for a new family member for both themselves and their 11-year-old Golden, Copper. It was love at first sight, and Mya was soon getting in the car for her ride home. Mya’s whole family is thrilled with their new girl. Copper is showing her the ropes and the two dogs love to share – walks, beds, and even toys. They like to play together, and Mya loves her new big yard, as well. Copper likes having a doggy sibling again and Mya loves all the attention she gets from everyone. Mya’s adopters adore their new addition and are happy to treat her like the princess she knows she is! Mya thanks you for your continued support. Thanks to you, we are here for dogs like Mya whose family’s circumstances have changed. We treat each dog as our own until they go to their very own new home, specially chosen just for them. This personalized care is only made possible with your help. Mya and all the Rescue Goldens thank you and send big wags and kisses your way!